It sprints from 0 to 62 mph in 4.8 seconds and is limited to a top speed of 155 mph, powered by a specially enhanced version of Volvo’s award-winning four-cylinder Drive-E powertrain. The performance engineers at Polestar have added a bigger turbo, new conrods, new camshafts, a larger air intake and a higher-capacity fuel pump to augment the engine and matched it with a BorgWarner four-wheel-drive system and the new Polestar-optimised eight-speed Geartronic automatic gearbox. On top of this new performance-optimised equipment, Polestar has radically reduced the car’s weight. 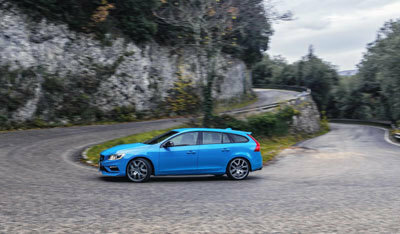 The V60 Polestar is 24 kilos lighter over the front axle and 20 kilos lighter in total compared with the previous version. This new model also marks the globalisation of the Polestar brand. The first road-legal Polestar cars were launched in 2014 to limited markets. Today, Polestar is delighted to announce that it is expanding the number of markets where a Polestar will be sold from 13 to 47, and doubling production volume from 750 cars a year to up to 1500 (these figures include the new S60 Polestar, which won’t be sold in the UK). The V60 Polestar traces its heritage to the new Volvo S60 Polestar TC1, the all-new FIA World Touring Car Championship (WTCC) race car from Polestar Cyan Racing. The new road car uses the same base chassis and engine, and the philosophy of the team behind the development. The race and road car feature a further developed four-cylinder Drive-E engine, with the two-litre, twin charged engine of the Volvo V60 Polestar producing 367 horsepower and 470 Nm. The changes compared with the standard T6 engine include a bigger turbo, new conrods, new camshafts, a larger air intake and a higher-capacity fuel pump. Despite the increased performance, fuel consumption and emissions are at a class-leading level of 34.9 mpg (8.1 l/100 km) and 186 g/km of CO2, further proving the efficiency of Volvo’s Drive-E powertrain. Part of the improved performance, and especially handling, compared with the previous model years is an optimised weight distribution. “All changes made to the car are about improving drivability and efficiency. The base of the new engine carries motorsport technology, with solutions such as the combination of turbo and supercharger, lightweight materials and more. This works hand-in-hand with our core philosophy and has enabled us to evolve the Volvo S60 and V60 Polestar,” said Henrik Fries, Vice President R&D, Polestar. Other new features on the car include new 20” lightweight alloy wheels, Polestar-calibrated electro-assisted power steering and a new slotted front brake disc of 371 millimetres. Prices for the new V60 Polestar will be announced at a later date, and first UK deliveries are expected in Q4 2016.